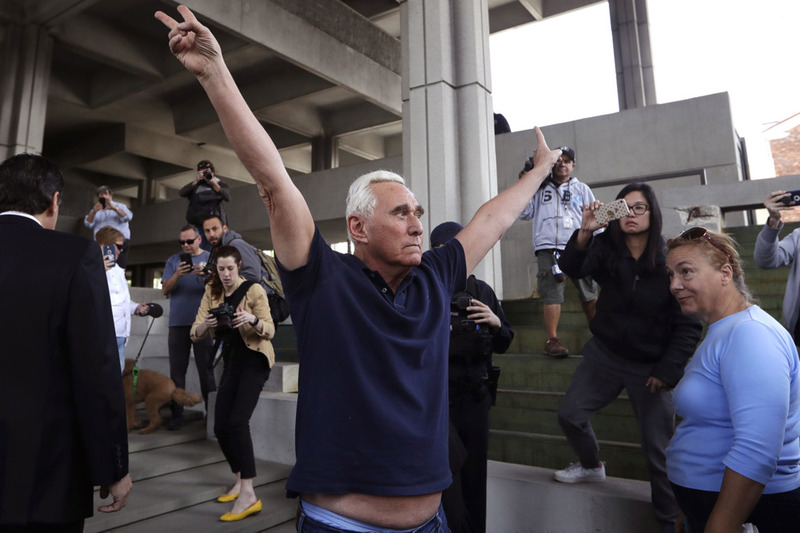 It happened yesterday, when legendary Tricksmeister Roger Stone, who was arrested for recklessly announcing and then lying about his Wikileaks alerts to the Campaign, emerged from the Fort Lauderdale Courthouse flashing a Make-America-Great-Tricky-Dicky-Victory-Sign, looking like a precocious contender in the World Wide Wrestling contest. Stone has added a devilish twist & turn to the continuing saga. We have now entered an entirely new and increasingly bizarre phase, in which we have become, beyond the shadow of a doubt: Stoned. Silly. Roger Stone has entered the fray as a holographic black mirror, reflecting and disorienting the already strange optics and underhanded dealings of the Russia Story. Stone is a master of the art of dark, menacing, political trickeries, and now, lo and behold, the haunted ghost of the specter of Nixon has taken center stage of the Show. The legendary Nixonian Tricksmeister now leads us through an hallucinogenic corridor of voodoo theater that once and for all collapses the great divide of historical time & space. Yes, Stone has taken the Show to new, unimaginable heights never before performed on the TRUMP stage. By injecting Nixonian Hysteria into the roaring, churning 24/7 news cycle of the XTreme TRUMPological Spectacle, we now bear witness to a newly concocted wicked dose of Absolute Confusion. What year IS this? Where are we? We are Stoned. We are in the presence of a crazed madman who rises to the occasion with mad sublimity despite the terrifying reality of being indicted and steamrolled by the ever-charging Mueller team. 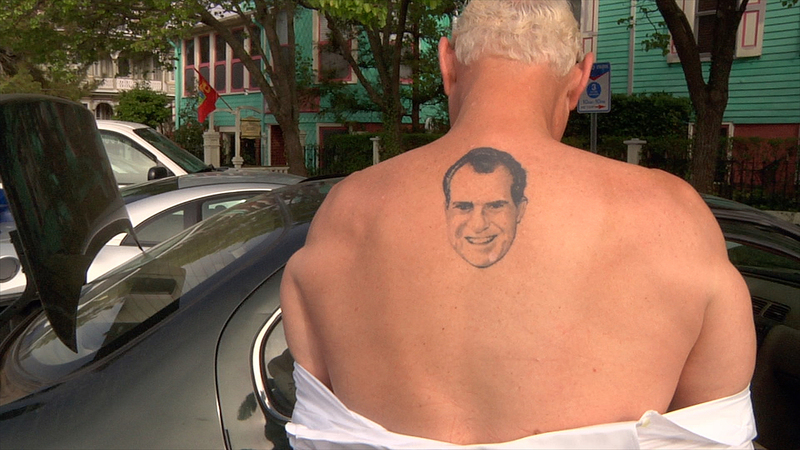 We are reminded of Stone’s extraordinary mememic skills, who since his Nixonian years has gleefully and virally worn an emblematic tattoo that scars and satirizes Stone’s oddly muscular backside. Where do we go from here? How low can we go as a nation and a culture? Have we lost all sense of the real in the mediated haze of TRUMPological XCess? Perhaps this episode is actually where it gets interesting, the ultimate test of America, purged of reality, a media circus, government paralyzed with intrigue and dysfunction, swarming with political vermin. The mind reels, confused, torn, spinning with dizzying vertigo: Stoned.